Fakokeftedes are lentil burgers. These vegetarian burgers started as an experiment one day when I had leftover Fakes Moudjentra. We loved them and ever since I make more to have leftovers. Usually when lentils with rice are leftover, the rice absorbs all the fluid so they become one mass which are not enjoyable to be eaten the next day. Although in this recipe I used leftover brown lentils, other kinds of lentils can be used or any other leftover legumes such as chickpeas, beans (red, white, black), fava etc. Before using them, you must drain them from any fluid they may have and puree or mash them. Then you can add your favourite herbs and spices and finally you need something to bind them together, such as flour or eggs. As you may see from all the different lentil burgers below, each one looks different depending on what ingredients are used and how they are cooked. Your main ingredient are the leftover Lentils and whether you will add eggs, courgettes (zucchini), carrot, bell peppers, onion, garlic, different spices, cornmeal all other flour to bind them, the choice is yours. The first time I made them I did not add onion or courgettes (zucchini), nor flour and shallow fried them. I made them again adding courgettes but since the courgettes release a lot of water, I added some flour to bind them. The flour was not enough so I added some cornmeal as well. Yesterday, I made them adding only cornmeal and added an onion as well. If you add feta, do not crumble it too much in order to get pieces of feta bursting with flavour and melting into your mouth. I am trying to cut down on calories so instead of frying them, I put them on parchment paper and baked them for about half an hour. Now they are not only delicious but with less calories as well. Two burgers, a slice of bread and lots of Greek salad (without feta and olives) was filling and a healthful meal. Even better with some real Greek Tzatziki as well if you are not counting the calories. The baked ones may look a little bit dry but try these lentils and you will love them as well. In a food processor puree the courgettes together with the egg. Add the onion and garlic and mix until pureed. Then add lentils a few tablespoons each time and process. Empty the puree into a bowl. Put the bread in the food processor and make the bread crumbs. Add them in the bowl, crumble feta, add herbs and spices and mix all the ingredients. Add cornmeal gradually* (you may not need all of it) and mix until they can be shaped. Refrigerate the mixture for a couple of hours and then form into patties. Line a baking tin with parchment paper and place the patties. Preheat oven to 180o C / 350o F (fan forced) and bake for half an hour without turning them over or until golden on top. If you want to fry them, heat the olive oil and fry on one side until a crust forms and then turn over. Fry on both sides until golden brown. *Note: the amount of flour or cornmeal will depend on how much fluid there is in the ingredients. For example your eggs may be bigger or the zucchini may have more water. Fry one first and if it falls apart when turning it over, add more flour. I am telling you, I am in love with these patties. I am making more lentils just to have leftovers, so I don’t need any excuse to make them. This time I used dill and filled them with feta. The best part is that when baked, they only have 100 calories each and if you are gluten intolerant, adding corn meal they are gluten free!!! Put the cooked lentils in a bowl and mix with all the ingredients, except feta and mix well. Take a heaped spoonful of mixture, flatten it in your palm, add a small slice of feta and cover with the mixture. Preheat oven to 180 C / 350 F (fan forced) and bake for half an hour without turning them over or until golden on top. They were served as a side dish to Fassolakia Yiahni (stewed green beans). This is my latest update. I made them a few days ago with more vegetables in them. 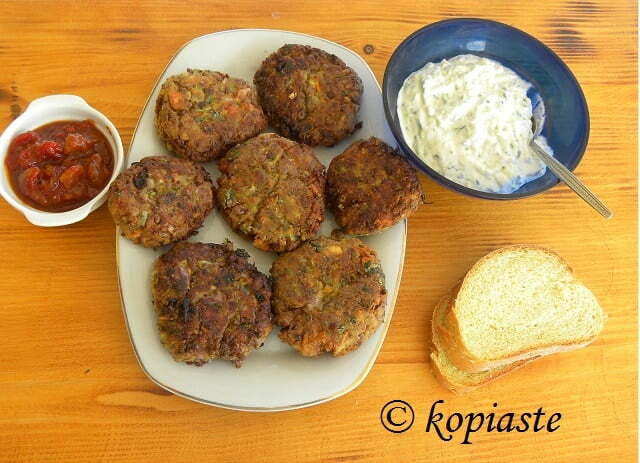 I fried the lentil burgers and served them with Fetatziki Sauce and Tomato Chutney. This combination was heavenly! The vegetables, especially the bell peppers, which were cut, gave an amazing taste and texture to these burgers. In these ones you can see some colour in them as well, mainly from the colourful bell peppers used. Mix all the ingredients except the last two. Heat the olive oil in a non stick frying pan and fry until golden, on both sides. Remove on kitchen paper to absorb any excess oil before serving. I love lentils…seriously, I eat them every single day! These lentil burgers look so good, Ivy. A great idea and scrumptious creation! I am a huge lentils fan, Ivy! This recipe sounds healthy and absolutely delicious! these are so lovely! The next time I make lentils I should make an a little extra batch to try this recipe. I’m sure my kids would love it. BTW while trying to find what fakes moudjentra is I landed back to your website through google :-). And it sounds so much like the Indian Khitchuri which of course has many different variations all over India. These patties look and sound delicious Ivy…I like the lentils with zucchini and all the spices in it. My kind of eats! These look wonderful. This would be an ideal dinner for me. Also, I’m jealous of those beautiful Greek tomatoes on the plate. I love these kind of “fritters” I guess you can call them. I already love zucchini feta fritters but lentils added is fabulous! They look delicious! Hi Ivy, I’ve made your Fassolakia Yiahni and I just love it. The lentil burgers sound nice as well. I’ll try them out! Cheers!